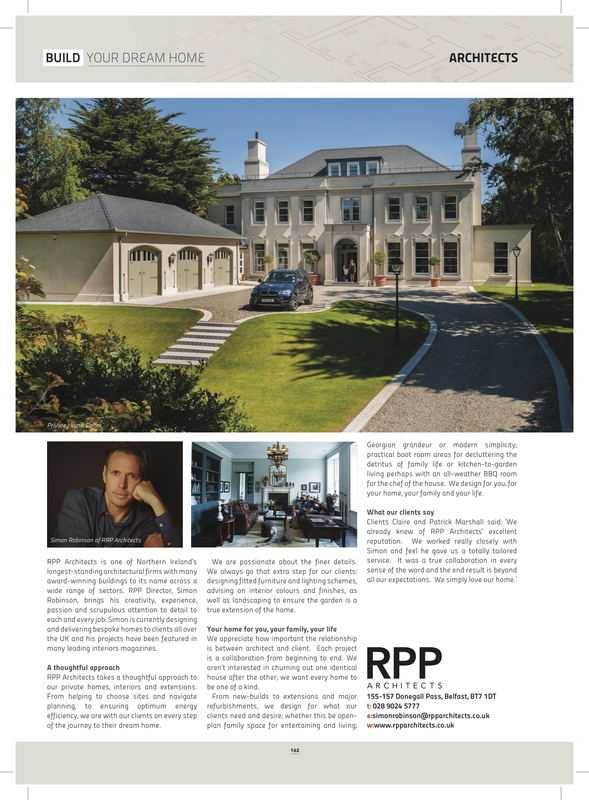 This month’s Ulster Tatler magazine contains an essential guide to building your dream home and features RPP Architects and Director, Simon Robinson. The firm, with its own specialist interiors team, helps clients on every step of their journey to building their dream home. From choosing sites and navigating planning, to choosing paint colours, lighting layouts and landscapes. RPP Architects appreciates how important the relationship is between architect and client. Each project is a collaboration from beginning to end. We aren’t interested in churning out one identical house after the other; we want every home to be one of a kind. From new-builds to extensions and major refurbishments, we design for what our clients need and desire: whether this be open-plan family space for entertaining and living; Georgian grandeur or modern simplicity; practical boot room areas for decluttering the detritus of family life or kitchen-to-garden living perhaps with an all-weather BBQ room for the chef of the EndFragmenthouse. We design for you, for your home, your family and your life. You can read the full article here or check out some of our finished homes on the Bespoke Homes section of the website.